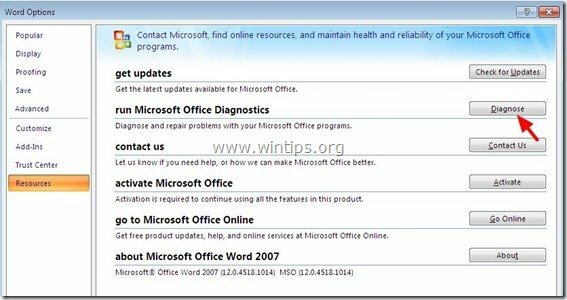 How to repair Office 2013, 2010, 2007 & 2003. 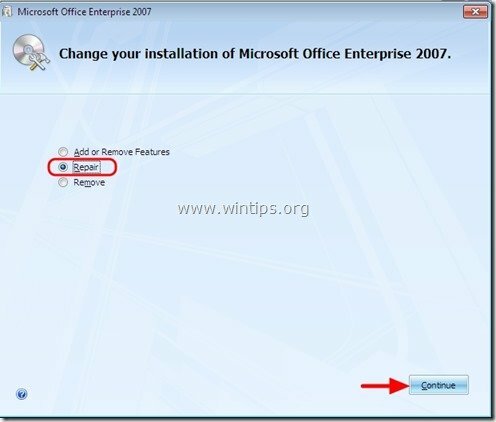 When your Office installation is corrupted (due to a virus attack, incompatible Add-on or unfinished installation) then you may face problems when you working with Office applications (Word, Excel, PowerPoint, etc.). In this tutorial, I will show you how to repair your Office installation in order to resolve problems occurred in Word, Excel, PowerPoint & Access applications. Attention: Before you continue to repair your Office Installation, first make sure that your computer is clean from malware, by using this guide: Quick Malware Scan & Removal Guide. 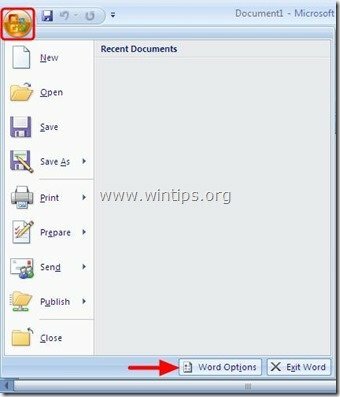 How to repair Office 2013 or Office 2010. 1. Go to Start > Control Panel. 2. Double click to open “Programs and Features”. 3. 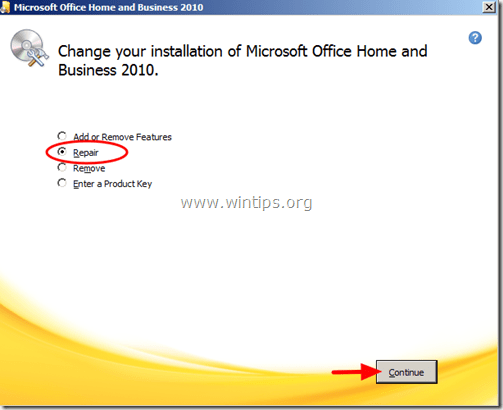 In the program list, select the “Microsoft Office” version installed on your computer and click “Change” from the top. 4. At the next screen check the “Repair” option and click “Continue”. Method 1. Repair Office 2007 problems from inside Office 2007 programs. * If you cannot find the Office Button, then you can find the “Office Diagnostics” feature under the “HELP” menu. 3. Click “Resources” from the left pane. 4. 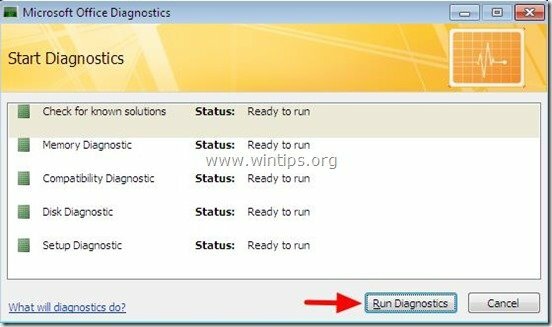 Press the “Diagnose” button next to “run Microsoft Office Diagnostics” option. 6. Finally click “Run Diagnostics” and wait until the diagnostic process is completed. Method 2. 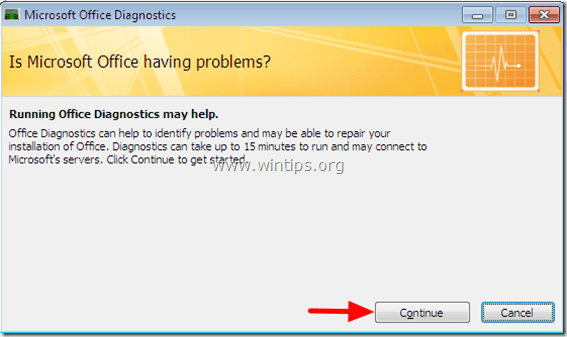 Run “Microsoft Office Diagnostics” tool from Windows Explorer. 2. Find and then double-click on “OFFDIAG.EXE” to start office diagnostics. 3. 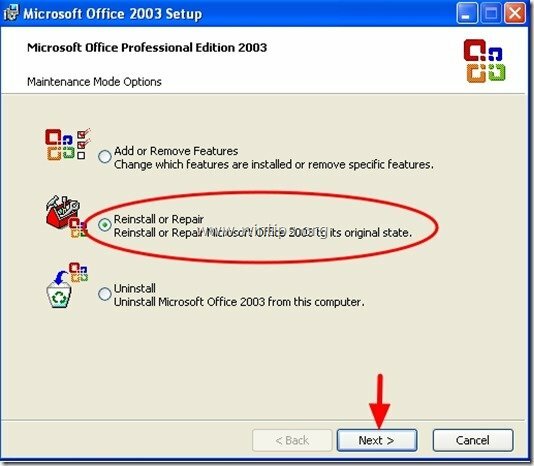 Follow the on screen instructions to repair Office 2007 installation problems. Method 3. 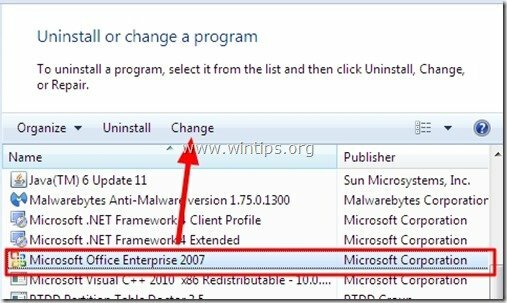 Repair “Microsoft Office” using “Programs and Features” options from Windows Control panel. 2. Double click to open “Programs and Features” (or “Add or Remove Programs” if you are using Windows XP). 4. Select the “Repair” option and then click “Continue”. Method 1: Repair Office 2003 by using the "Detect and Repair" option. Note: The “Detect and Repair” tool may ask you to insert your original Office Installation CD-ROM during the repair process. 4. Wait until the repair process is completed and you ‘re done. 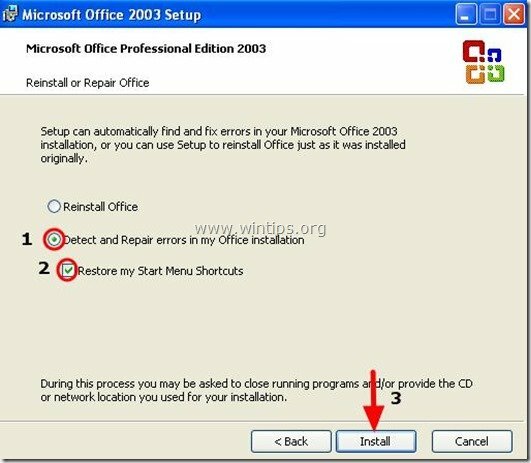 Method 2: Repair “Microsoft Office” by using “Programs and Features” options at Windows Control panel. *. On Windows 7,8 the “Change” option can be found on the top of the program list. 4. At “Maintenance Mode Options” screen, select the “Reinstall or Repair” option and then press “Next”. 5. Next check the “Detect and Repair errors in my Office installation” and the “Restore my Start Menu Shortcuts” under it and press “Install”.